View of face of Pictish symbol stone with cup marks. This stone, at NH 5518 4357, is basically as described by Jolly, it is 1.3metres high, 0.8 metres wide and 0.3 metres thick. Apart from the figure of a man, only three cup marks are now visible. Scheduled as 'Balbalir Stone, symbol stone, Moniak [Moniack] Castle Wineries... an earthfast, upright carved stone bearing abstract and figurative carving which is prehistoric and early medieval in date'. The stone is 1.3m high, 0.8m wide and 0.3m thick, and displays the Pictish carving of a man apparently walking from left to right holding a staff or sword, as well as prehistoric cupmarks. It is situated within a modern garden rockery immediately SW of Moniak [Moniack] Castle. Information from Historic Scotland, scheduling document dated 9 March 2007. For original location (NH54NW 155 c. 509 451), see NH54NW 155. 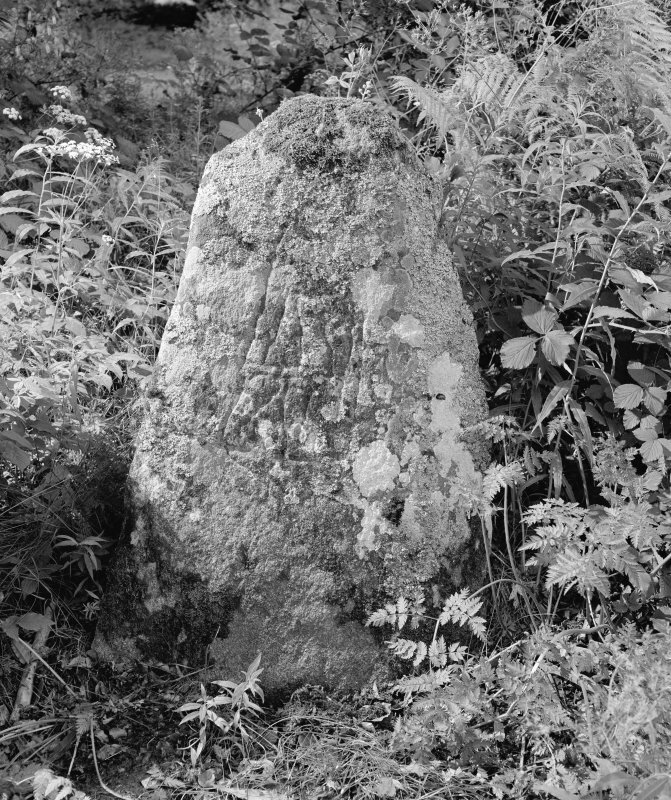 In the rockery at Moniack Castle is a stone, about 4 1/2 ft. in height, bearing the outlined figure of a man with a stick or other instrument in his hand, and fourteen cup-marks, one of which has been mistaken for the eye of the figure. The stone stands at the end of the rockery farthest from the entrance gate. 'This stone was brought from a spot where it stood for a time, close to the old parish school of Kilmorack, near Kilmorack Free Church. It was however, removed to this place between fifty and sixty years ago, from a spot 100 yard further west, when the ground was them reclaimed. There is nothing known of the stone, traditional or otherwise, beyond this.